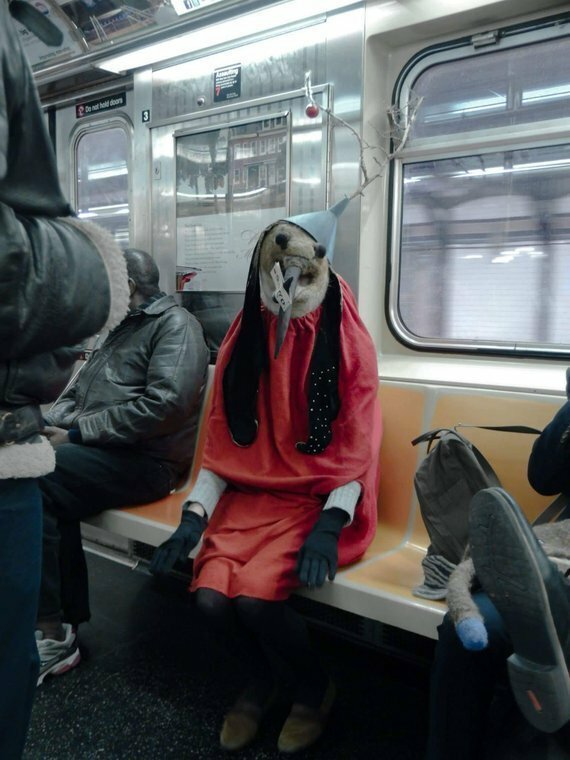 To me, the great promise of homeschooling is that one day your child might, on their own initiative, ride the New York City subways dressed in a homemade, needlefelted costume modeled on the ice-skating bird messenger from Hieronymus Bosch’s The Temptation of St. Anthony. Growing up I was home schooled in the countryside by my mom who is a sculptor and my dad who is an oil painter, carpenter, and many other things. Most of my days were spent drawing and observing nature rather than doing normal school work. Learning traditional art techniques had always been very important to me so that I can play a role in keeping these beautiful methods alive during this contemporary trend of digital, nonrepresentational, and conceptual art. I make traditional artwork in a wide variety of mediums, including woodcarving, oil painting, etching, needle felting, and alternative process photography. Even the tiniest creature produced by this method is a labor intensive proposition, wherein loose woolen fibers are soaked, soaped, and jabbed with a needle until they come together in a rough mat, suitable for shaping into the whimsical—or demonic—figure of its creator’s choosing. 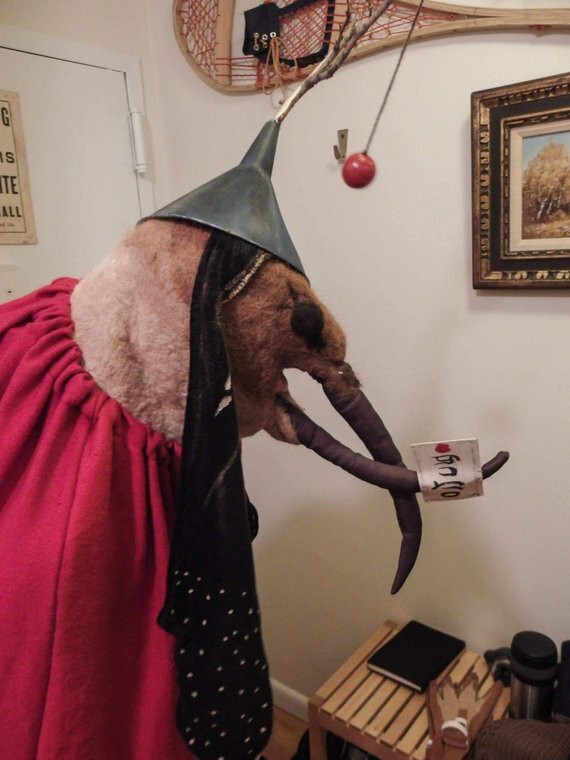 Stimson matched her full-head bird mask to the one in the painting by equipping it with gloves, a blanket cloak, long velvet ears, and a leafless twig emerging from the spout of its hand-painted funnel hat. …a monster on ice skates approaches three fiends who are hiding under a bridge across which pious men are helping an unconscious Saint Anthony. The monster, wearing a badge that Bax says can be recognized as the emblem of a messenger, bears a letter that is supposedly a protest of Saint Anthony's treatment. 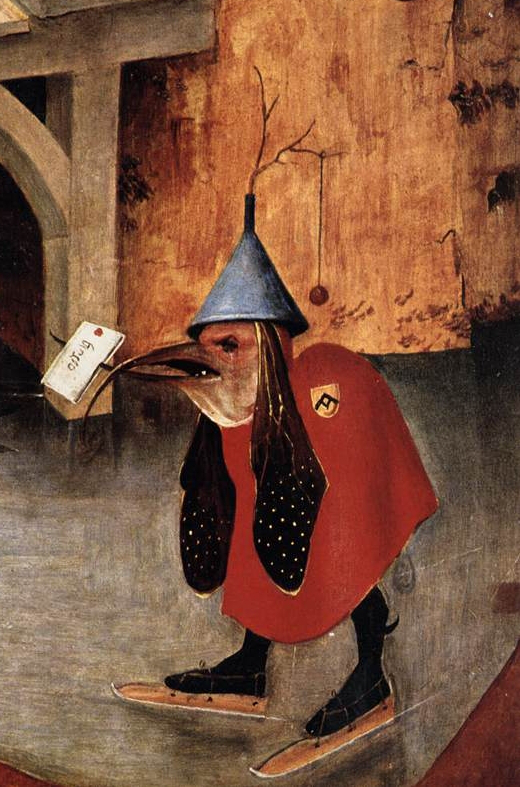 But the letter, according to (Bosch scholar and author Dirk) Bax, is in mirror writing, a sure sign that the monster and the fiends are mocking the saint. The monster wears a funnel that symbolizes intemperance and wastefulness, sports a dry twig and a ball that signify licentious merrymaking, and has lopping ears that show its foolishness. All this might have been obvious to the artist's contemporaries when the work was created, but the average modern viewer can only hope to understand the overall intent of a Bosch painting, while regarding the scores of bizarre monsters and demons as a kind of dark and cruel comic relief. 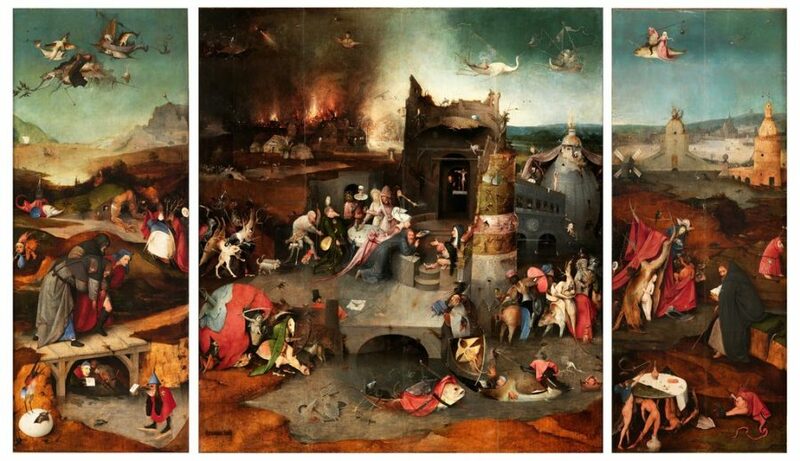 A field guide to Bosch’s bizarre images in the same article gives viewers leave to interpret any and all funnels in his work as a coded reference to deceit and intemperance... perhaps at the hands of a false doctor or alchemist! 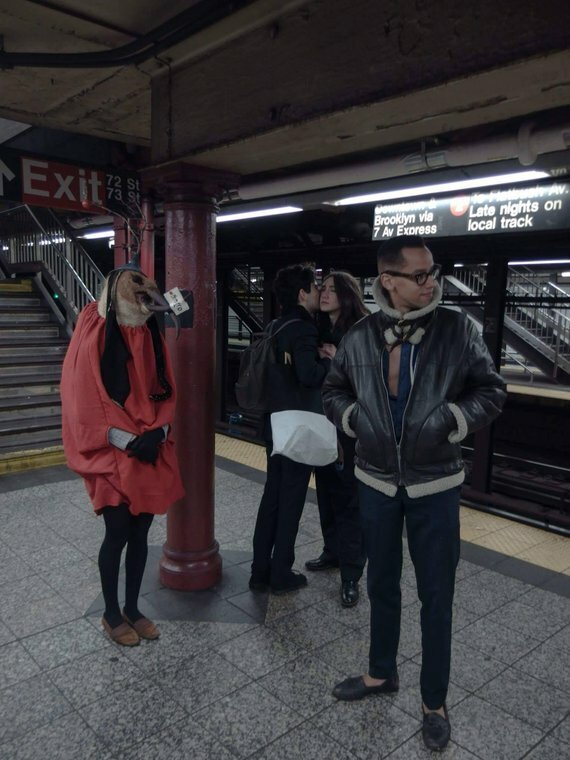 Within 24 hours of its Metropolitan Transit Authority adventure, the one-of-a-kind demon-bird costume was sold on Etsy. See more of Rae Stimson’s needle-felted creations, including a full-body alien robot costume and a sculpture of author Joyce Carol Oates with her pet chicken in her Etsy shop. Ayun Halliday is a New York City-based homeschooler, author, illustrator, theater maker and Chief Primatologist of the East Village Inky zine. Join her at The Tank NYC on Monday, September 24 for another monthly installment of her book-based variety show, Necromancers of the Public Domain. Follow her @AyunHalliday. Too early for April Fool’s! Alright.